A meniscus injury develops when there is damage to the special cartilage that lines the knee joint. Meniscus tears may develop suddenly due to an injury, or come on gradually over time due to wear and tear. The most common meniscus tear symptoms are knee pain, swelling, stiffness, instability and sometimes locking - where the knee gets stuck in one position. Here, we will look at the causes and different types of cartilage injuries as well as common meniscus tear symptoms and treatment options. The meniscus is made up of thick, crescent shaped bits of cartilage that line the knee on either side of the joint. There are two parts, the medial meniscus, on the inner side of the knee and lateral meniscus, on the outer side of the knee. The meniscus acts as a shock absorber and ensures there is correct weight distribution through the knee. Medial meniscus tears are the most common as more force tends to go through the inner side of the knee, resulting in medial knee pain. A meniscus injury usually happens during sporting activities e.g. football, rugby and skiing. Usually they occur when the foot is fixed (e.g. 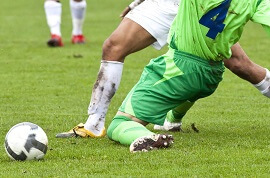 studs in the ground) and the knee is slightly bent and then twisted by a sudden turn initiated either by you or by a force to the outside of the knee. Medial meniscus tears are more common than lateral meniscus tears and often the medial collateral ligament (MCL) is injured at the same time – see MCL Tear. Cartilage tends to become more brittle with age and everyday use of the knee can cause a meniscus injury. Often this affects the edges of the meniscus which get frayed and torn. Symptoms may gradually build or they may be triggered by a particular event e.g. twisting the knee awkwardly. Meniscal tears are also a common feature of knee arthritis. With a meniscus injury there is often a lot of pain in the knee, especially when trying to straighten the leg fully or when bearing any weight though it. Activities such as coming down stairs and squatting down are often painful. Swelling usually develops gradually over the first 48 hours after an injury. The amount of swelling will depend on the severity and location of the injury. With a more severe meniscus injury there may also be locking of the joint. This is where the joint gets stuck in one position and can’t move. 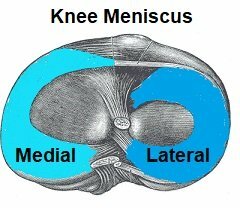 A meniscus tear is the most common cause of knee locking. b) Pseudolocking – this usually occurs due to pain. If performing a movement is particularly painful, the body will often prevent itself from moving further to try and make sure no more damage is done. If you don't have any of these meniscus tear symptoms, it is unlikely that you have a cartilage injury. Visit the knee pain diagnosis section for help working out what else may be causing your pain. Unfortunately, torn knee cartilage is not very good at regenerating. Tissues require a good blood supply to heal and whilst blood capillaries do feed the outer edges of the meniscus, the central parts of the meniscus are avascular (have no blood supply). This stands for Protect, Rest, Ice, Compress and Elevate. This is the best place to start for the first few days before moving on to a rehab programme to strengthen the knee and regain any loss of movement and function. Visit the PRICE treatment section to find out how to use the different elements safely and effectively. Building up the strength of the muscles surrounding the knee joint helps to reduce the amount of weight going through the knee and therefore through the cartilage, and can really help to reduce the effect of a meniscal tear. Muscle weakness of the glutes and kneecap muscles often causes excess force to go through the medial meniscus resulting in an injury, so strengthening these muscles can particularly help. Visit the meniscus injury exercises section for simple exercises you can do at home to recover. Ice can really help to reduce the pain and swelling associated with a meniscus injury which helps to speed up healing. Visit the ice treatment section for the most effective ways to apply ice. This is an elasticated compression bandage that can help in the short term to reduce swelling and to provide some support to the knee. Long term use of tubigrip is not advised as it can result in weakening of the muscles. Visit the tubigrip compression section to find out more about how it works and how to get the right size for you. Knee braces provide much more stability than tubigrip, so can be really useful after a meniscus injury, especially if the knee feels unstable. Usually a basic advanced brace basic or advanced knee brace will provide enough support. 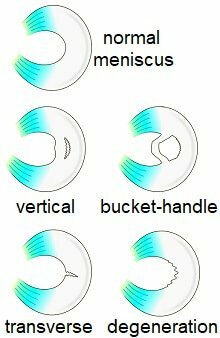 If your meniscus injury is associated with a ligament injury you may need an Elite brace. If exercises haven’t resolved your meniscus tear symptoms, your doctor may advise surgery. Most surgery for a meniscus injury is performed arthroscopically (keyhole surgery). This is where they make two or three small holes around the knee and a camera is inserted into the knee. The surgeon will remove any debris (torn bits of cartilage) and sew up tears where possible as shown in the video here from the American Academy of Orthopedic Surgeons. The aim is to preserve as much of the cartilage as possible since it won’t regrow. You can usually go home the same day. 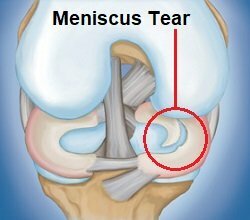 Meniscus tears are a common knee problem, especially in sports or as we get older. The best way to prevent the cartilage from getting torn is to keep the knee muscles strong so the knee is well supported and less weight goes through the joint. If a meniscus injury isn’t sounding quite like your knee pain, visit the Knee Pain Diagnosis section for help working out what is wrong.